Just in time for the cold snap, or perhaps the sweatshirt is slowly becoming a year round garment for the Great British year-round, season-less weather we have been experiencing of late. 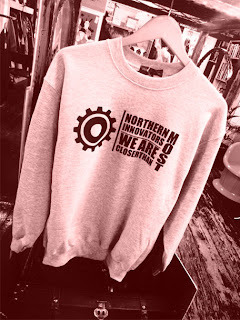 This is the first in a selection of sweatshirt offerings we have coming your way over the next few weeks or so. Just in time for Crimbo! 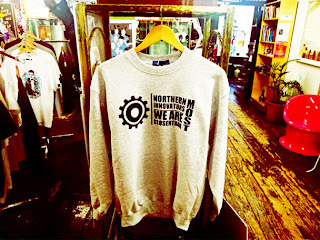 The 'Northern Innovators' sweatshirt is a nod to all the cool things that been born in the north. From The Buzzcocks to The Smiths ,Scallies to the Perrys. There is no denying that the north is possibly the capital of cool when it comes to unique innovation. Available in ash grey on heavyweight 100% cotton sweatshirts. Handprinted in Manchester. Its all been quiet on the home front in terms of product updates and general postings. There's a very simple reason for that, we have been super busy setting up shop in Manchester! We also thought it was finally time to pull our finger out and get the blog up and running. The website is currently undergoing another overhaul and being updated with new products available for purchase. Keep posted and don't forget to check back at the blog for more updates and our usual ramblings.